Shingle – wooden tiles has long history and is still valued and used for their special qualities: durability, environmental friendliness, unique appearance, the building of reliable protection against any adverse weather effects. Thanks to its core strength – ability to “breathe” after the installing does not condensate. Such a coating, rain, a strong wind, hail, has no noise, and most importantly, the human-nature relationship and consistency with you to the wider natural landscape, embodiment. Shingle – The roof and facade coating is produced under the old technology of the German team of valuable types of wood: larch or oak. Lithuania still has some use aspen wood, while other countries such as Canada – Canadian red cedar, mid Germany – dull. All land areas, which are characterized by a rich forest vegetation, wooden tiles have been used since the settlement of these lands. Nails at the time was not yet, so that individual tiles were simply put in rows on the roof and fixed with wooden beam and pressed with the stone. Alpine region, and even now can still be found as-coated roof. So far, split shingles are the oldest form of coating. This shingle surface form, has been produced exclusively for splitting wood by hand. Even then, when there were saws invented, shingles were produced by splitting the wood. After all, sawing the wood fiber is cut off, and splitting by hand along the wood fibers are separated and remain intact through the entire length of the shingles. No one denies that the wooden house creates a unique, beneficial health microclimate, reserving the optimal humidity inside the house. Exactly the same effect has wooden shingles or chip surface. For all coatings sold in the market have 5 – 20 years warranty. This number, however, shingles cover, you can safely assume, will serve 100 years or more. Qualitatively to the cost of shingle roof, usually three layers of coating to reach 3 cm or more, with full air-tightness. So, in such a way, in winter heat accumulation is in the shelter’s part space, that’s why this coating serves a hundred or more years without additional maintenance. Seemingly fragile coating provides reliable protection from rain, wind, heat, cold. In the rain, shingles tiles from moisture and swelling cover tightly cuddles. After a little rain during drying tiles squeezes out, while ensuring that the purging and removal of excess moisture. The fact that the wood surface to breathe and installation shall be made on the air gap between the coating and the roof structure, roof ventilation takes place, which significantly increases the load-bearing structures and the pavement life. This is thanks to a house in the summer is cool, because the strong heating of the wooden surface, and in winter, wood coating layer will hold part of the house placed in the heat. Technical larch and oak wood properties by the presence of tanning (tannins) materials, the coating has a particularly resistant to environmental influences. The construction of the house need not be mounted a strong roof structure, which is especially important for the installation of an attic. Coverings can be installed and at low temperatures. In some European countries and the spread shingle facade decoration. This affects the minimum cost of maintenance of wall coverings. The wooden shingles cover – this element attracts the surrounding sights, as well as requiring the stylistic and architectural. This architectural expression way to implement the most courageous decisions. the beauty of the wood structure and its decorative features. Oak (Quercus robur) – widespread in the verdant summer deciduous tree possessing strong, solid core. Dark brown alburnum core surrounded by a light-colored wood is used for the manufacture of shingles. Due to the large number of substances it contains sour wood is resistant to external shocks and decay. Weather conditions affect the wood-very slow deterioration. Shingle oak is recommended to cover coatings that require special quality. 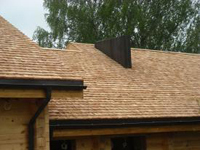 For more than larch balance, decreasing the production yield of shingles, which results in a higher price for them. How is possible to identify a small gap of less than larch‘s shingles life.